Robey Street station was typical of those built in 1892-93 for the Lake Street Elevated Railroad -- similar to stations at Ashland, Homan and Sacramento, among many others -- designed by its engineering staff and built by the Lloyd and Pennington Company. The station had twin station houses and side platforms for boarding inbound and outbound trains. The station houses were designed in a Queen Anne style with a Victorian Gothic influence. The station houses had gabled roofs with two windowless gabled dormers each. Each roof was topped with a unique square cupola with a diamond pattern and a steeply hipped roof with a small gabled dormer in each of the four sides. These structures represent a unique attempt to apply the Queen Anne architectural style. 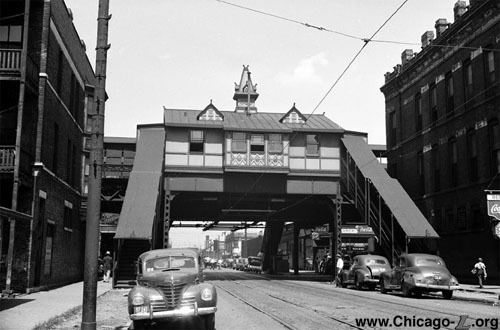 Robey station was renamed Damen by the early 1930s, when the street it served was renamed. The station was closed in 1948 when the CTA revamped service on the Lake Street Line -- the first of a series of line-by-line service overhauls -- by closing 10 little-used stations and implementing A/B skip-stop service to speed up trains on the route. 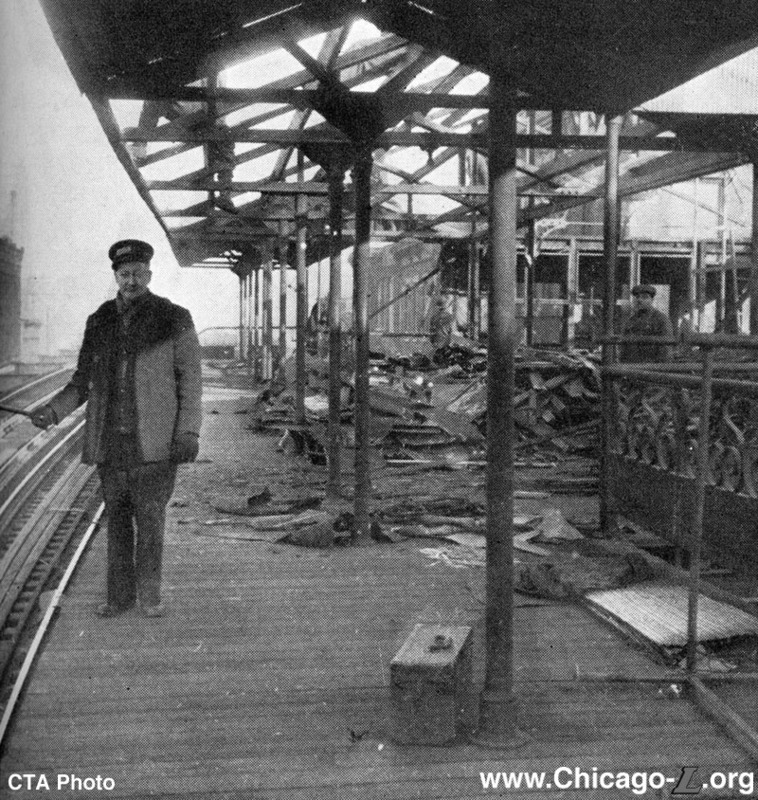 The station, along with Morgan, Racine, Oakley, Campbell, Sacramento, and Kostner, was demolished in early 1949. 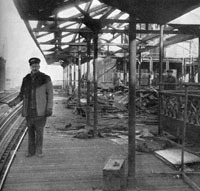 Prior to the start of wrecking work, all usable equipment, such as newer lumber, doors, and newer railings were removed for reuse elsewhere. Platform girders from the dismantled stations were reused to lengthen platforms at other "L" stations. A 2002 study by the Chicago Department of Transportation examined daily boarding at potential new "in-fill" stations -- stations that close the gap between existing stations, particularly where those gaps are longer than typical intervals between stops -- on the Lake Street and South Side main line Green Line branches, including Morgan on the Lake Street branch. Based on that study, the City built stations on the Green Line at Morgan in 2012 and Cermak-McCormick Place in 2015. Damen was one of the other sites on the Lake branch studied at the time, being projected to have the second highest number of boardings of the locations analyzed. 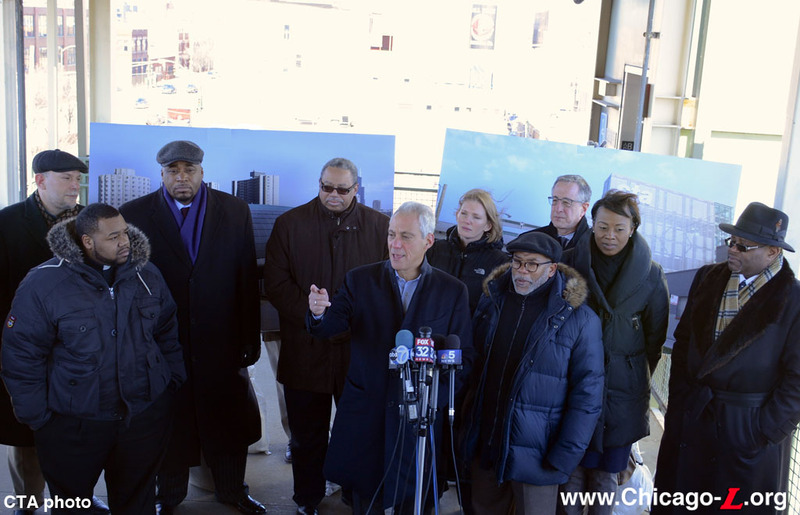 On February 9, 2017, Mayor Rahm Emanuel joined Alderman Walter Burnett, CTA President Dorval R. Carter and city officials to announce plans for a new station on the Green Line at Damen. The new station will fill a 1.5-mile gap between existing Green Line stations at California and Ashland to better serve the growing business corridor and residential neighborhood on Chicago's Near West side. The Damen station will serve a Near West Side community that has seen notable residential and commercial growth in recent years. The new station will improve public transit options for businesses in the Kinzie Corridor and nearby residents, including tenants of the Chicago Housing Authority's Villages of Westhaven complex. The station will also serve visitors to the United Center. Although it is not the new station's sole or primary purpose, officials had been eyeing better service to the United Center for some time. A new station closer to the United Center on the Pink Line at Madison had been suggested in the past by transit advocates, but officials said the area just north of the United Center had sparked residential and commercial growth in recent years, making Damen a better site so the station could serve multiple markets and functions. The TIF funding that is being used to finance the station's construction is also available at the Damen site, but a Madison station would be outside of the Kinzie Industrial Corridor TIF boundaries and other funding for a Madison station is not readily available. 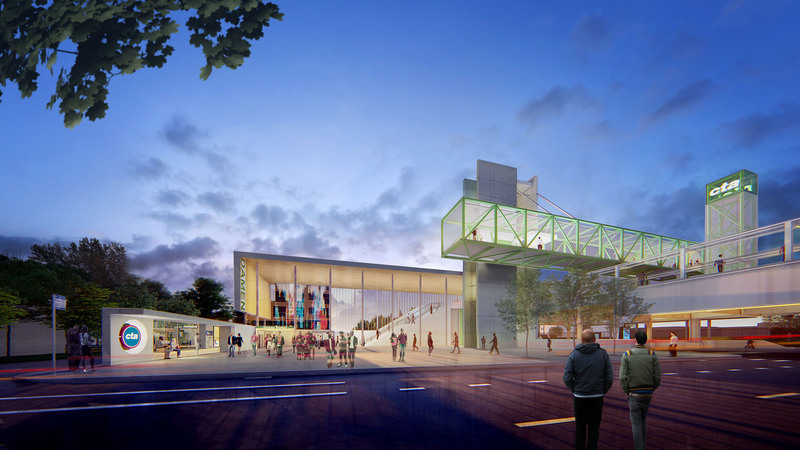 The $60 million Damen station project is being led by CDOT and is being designed by Perkins+Will, a global architecture and design firm known for striking transit station projects around the world. The station house will feature a low concrete wall on the south and west sides, and a wood-paneled south wall and ceiling. 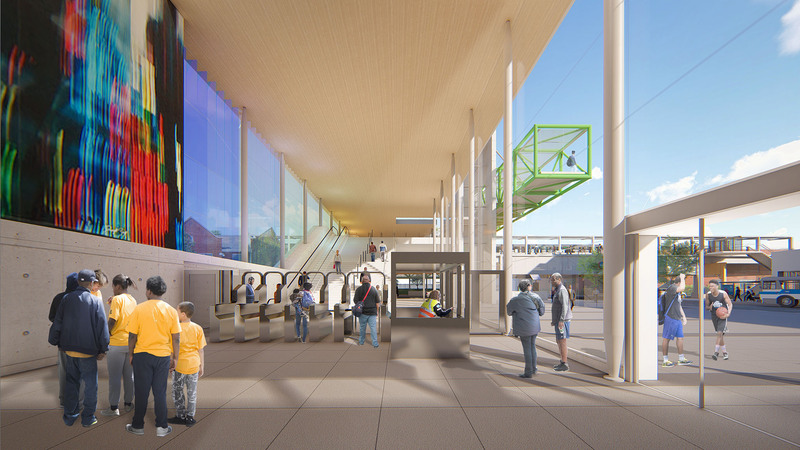 After passing through the turnstiles, passengers will encounter a grand stair and escalator ascending to an indoor lobby at platform level, with doors leading directly to the inbound platform and another set of stairs up to the transfer bridge to cross over to the outbound platform. 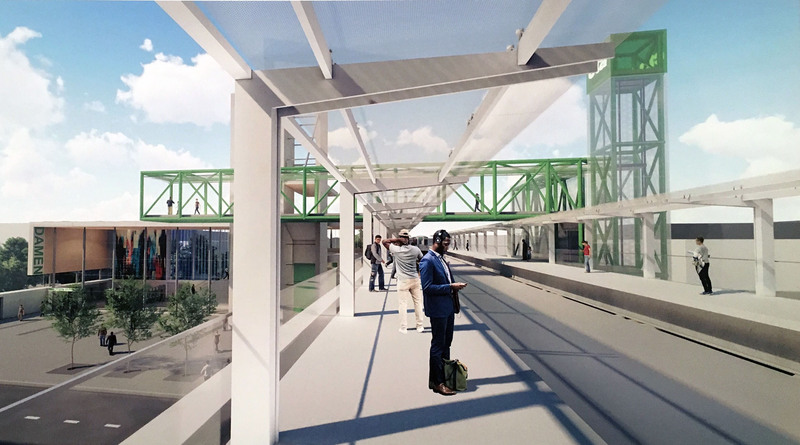 The station will feature dual side platforms extending across Damen Avenue. The platforms will have precast concrete decks. Each platform will have a canopy covering most of its length. 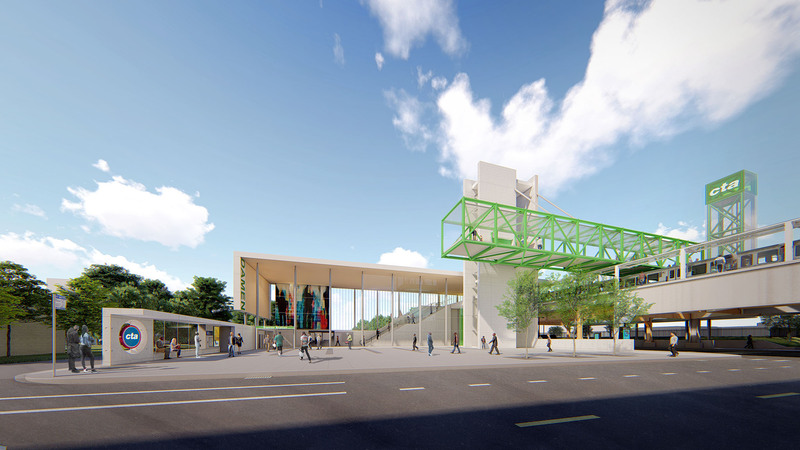 Renderings show each canopy designed with a flat, angled roof cantilevered from a row of I-beam support columns along the back of the platform. The platforms will have non-accessible auxiliary exits at both ends of each platform, in addition to the single entrance on the southeast side of the station. Asked by Streetsblog Chicago why either platform -- but especially the outbound platform -- could not have an unstaffed high-barrier gate (HBG) auxiliary entrance for more direct access, Claffey said that if there was a non-accessible entrance to the westbound platform there would have to be an accessible entrance to the westbound platform. And if there’s another accessible entrance, then there has to be another CTA station assistant,8 something that was presumably felt to not be preferable. 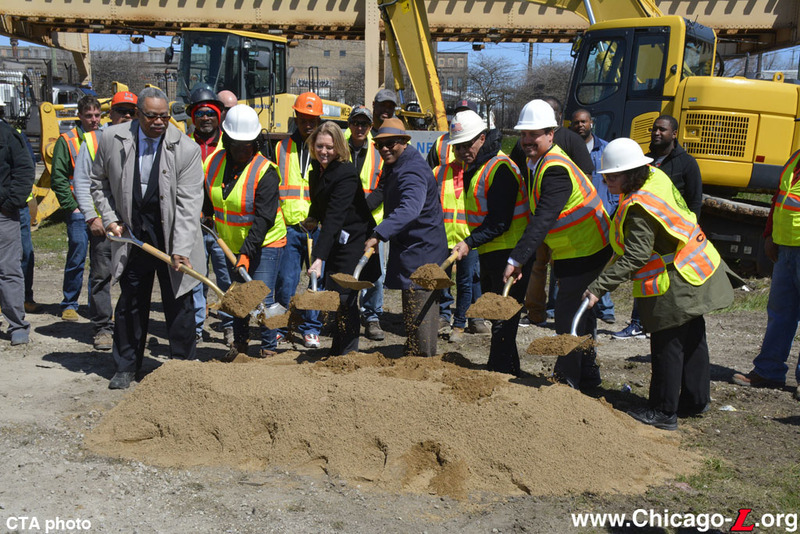 CDOT and CTA broke ground on the new Damen station on April 25, 2018 at an event attended by CTA President Dorval Carter, CDOT Commissioner Rebekah Scheinfeld and and Alderman Walter Burnett (27th Ward). The initiative will start with a $12.9 million project to fully reconstruct a half-mile stretch of Lake Street from Ashland to Damen. The roadway work will improve access for trucks in the bustling Kinzie Industrial Corridor by increasing the vertical clearance under the "L" tracks, and will also begin the foundation for the new station by relocating four structural columns that support the elevated tracks at the intersection of Damen and Lake to accommodate the new station. The Lake Street reconstruction project will be complete by the end of 2018. Following the relocation of the columns at Damen, work on the foundation is expected to start in late 2018 with work on the station house to start in the spring of 2019. Design for New CTA Damen Green Line Station [YouTube]: Fly-through video of the striking, modern design plans for the new CTA Damen Green Line station planned at Lake Street and Damen Avenue on Chicago's Near West Side. The design plan is by Perkins + Will, a global architecture and design firm. 1. Lulay, Stephanie. "New $50 Million Green Line Station Planned Near United Center". DNAinfo Chicago, February 9, 2017. 2. 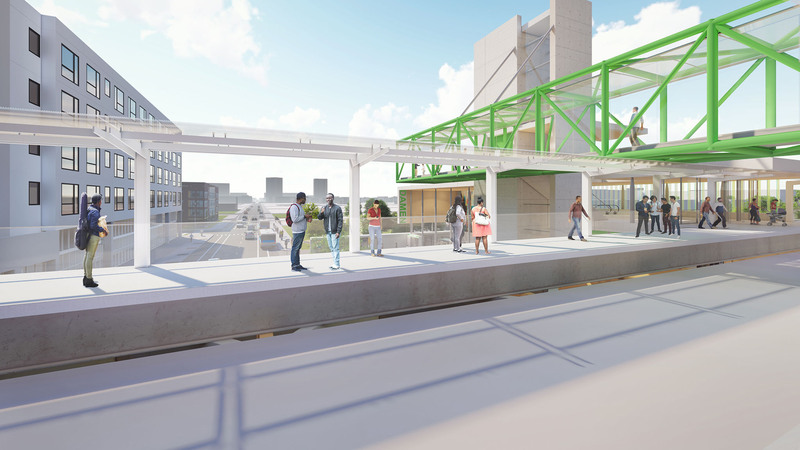 "Perkins+Will-Designed Damen Green Line Station Will Enhance Access and Economic Development in the Near West Side." perkinswill.com, July 16, 2018. Accessed January 29, 2019. 5. Wisniewski, Mary, "City releases design of new Damen Green Line CTA station." Chicago Tribune, July 9, 2018. 6. Vance, Steven, “City Should Raise Priority of Using Damen Green Line Station to Prime Good Land Use.” Streetsblog Chicago blog, Aug 15, 2018.